Pixi Nourishing Cleansing Balm – what is it? It looks solid in the tub, but I do find that in our warm weather here in Malaysia (and we’ve been experiencing a crazy heatwave recently), it does have a softer texture. Not as soft as Emma Hardie or Elemis which I recommend storing in the fridge to keep it solid, but soft enough that it melts quickly in your hand. It also has a slightly granular feel, although it melts to a smooth thick oil. I don’t know how this performs in colder weather, but for me, it is, as the description on the tub says, a “balm to oil cleanser”. It looks like a balm, feels like a balm, but when you warm it up in your hand, it turns into a thick oil. You’d use it as your first cleanse to take off your makeup or your face of the day. You can then follow up with a second cleanse. It smells of roses, which surprised me, because no one really mentions it. But it contains oils and emollient ingredients, that gives you that oily slip. And that oily slip is what many people dislike, unfortunately. How best to use the Pixi Nourishing Cleansing Balm? The first thing to note is this. 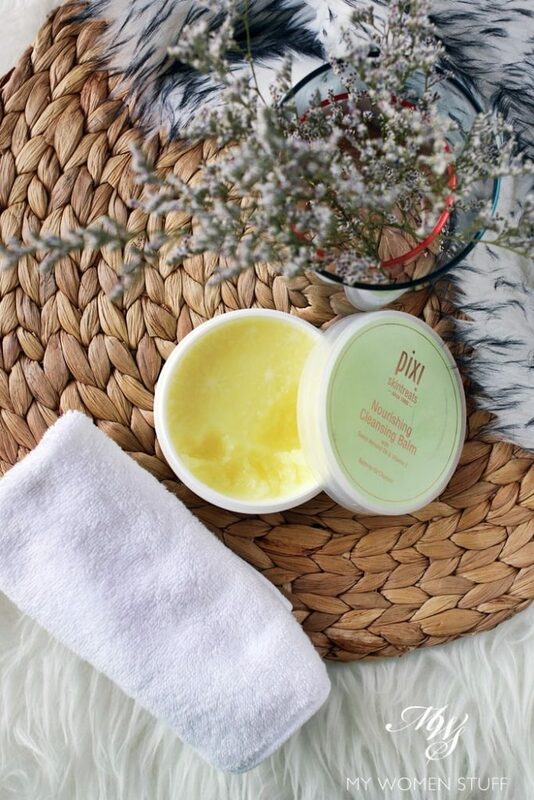 The Pixi Nourishing Cleansing Balm will not rinse off. It is a thick oil texture that sticks to your hand and skin and will not emulsify at all. If you don’t like a texture like that, then it’s best to stay away because you will hate it. It reminds me of the Antipodes Grapeseed Butter cleanser, but more oily. I love the Antipodes one, but many people don’t, because it doesn’t emulsify. But here’s the best way to use the Pixi Nourishing Cleansing Balm. Scoop a little balm into the palm of your hand. Warm it up between your palms. It may feel a little gritty at first, but it will melt. Take a face flannel (face cloth), run it under warm water, place it on your face for a few seconds, and then wipe off. Repeat as necessary to remove all traces of the cleanser. Do note that it is absolutely essential to use a face flannel to remove this cleanser, because you can’t otherwise remove it easily. But there are benefits to this. If you remember, I waxed lyrical once about using face flannels, and how they helped transform my skin. I’d stopped using it for a while, because I was using more emulsifying cleansers as I told you earlier. However, during this time that I’ve been using the Pixi Nourishing Cleansing Balm, I have noticed that my skin feels smoother, and looks better and cleaner. It’s made me fall in love all over again with using face flannels to cleanse my skin, and I swear that it is transformational for all skin types. Try it for yourself, if you don’t believe me! Pixi recommends that you use a muslin cloth (not provided) but I personally find muslin cloths a little harsh. I use soft face towels instead that I find more gentle on my skin. Do not rub or tug. It is not necessary. The Pixi Nourishing Cleansing Balm can feel like there’s a residue left on your skin even after cleaning off. If that bothers you, I’m going to suggest that it isn’t the right cleanser for you. Your skin should feel soft, smooth, clean and plumped, not squeaky clean and tight. Do I like the Pixi Nourishing Cleansing Balm? Yes I do. I love it! The cleansing aside, I find that the oils in the product help to nourish and soften my skin. Do note however, that I have dry skin and it really does make my skin feel very comfortable. I do find that the thick oil texture almost seems to nourish my skin right from the cleansing stage. Instead of feeling waxy as many emulsifying cleansing balms do, this feels like a thick, lush oil on the skin. 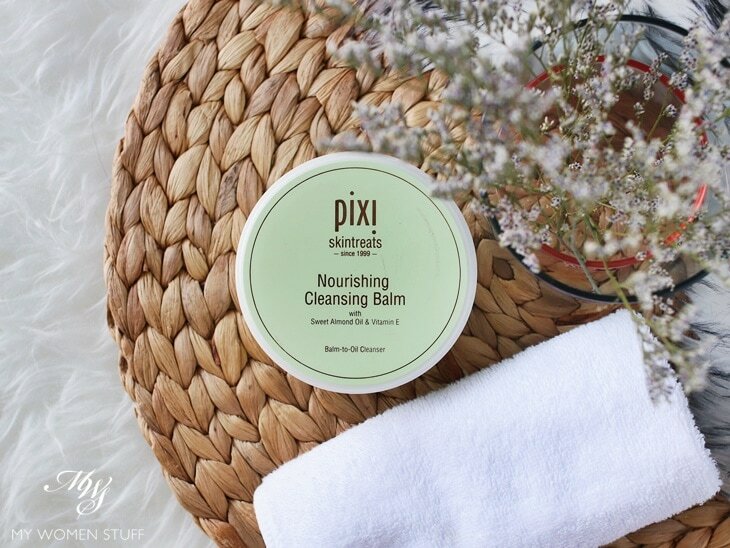 The Pixi Nourishing Cleansing Balm is a balm to oil cleanser. This means that it is in fairly solid form (in colder weather. In warmer weather it can feel a little soft and may shift in the tub) but on contact with the warmth of your skin, it melts into a thick, lush oil. Massage the oil all over your face, leave it for a little while, and then remove with a warm face flannel. It makes skin feel lush, soft and clean. I absolutely love it! Ingredients: Prunus Amygdalus Dulcis (Sweet Almond) Oil, Theobroma Cacao (Cocoa) Seed Butter, Cetearyl Isononanoate, Caprylic/Capric Triglyceride, Glyceryl Behenate, Cetearyl Olivate, Sorbitan Olivate, Glyceryl Stearate, Glyceryl Cocoate, Butyrospermum Parkii (Shea) Butter, Lecithin, Tocopherol, Cetyl Alcohol, Benzyl Alcohol, Fragrance. Have you tried this Pixi cleansing balm? Do you still use a face flannel? I found this too oily / thick for my liking. Pity about that, it looks like you aren’t alone in disliking it! Thanks for sharing. Will definitely give this brand more attention the next time I shop at Sephora.